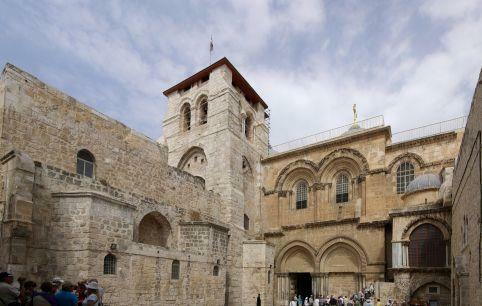 The Church of the Holy Sepulchre, is a church within the Christian Quarter of the Old City of Jerusalem. It is a few steps away from the Muristan. The site is venerated as Calvary, where Jesus of Nazareth was crucified, and also contains the place where Jesus is said to have been buried and resurrected. Within the church are the last four Stations of the Cross along the Via Dolorosa, representing the final episodes of Jesus’ Passion. The church has been an important Christian pilgrimage destination since at least the fourth century as the traditional site of the resurrection of Christ.